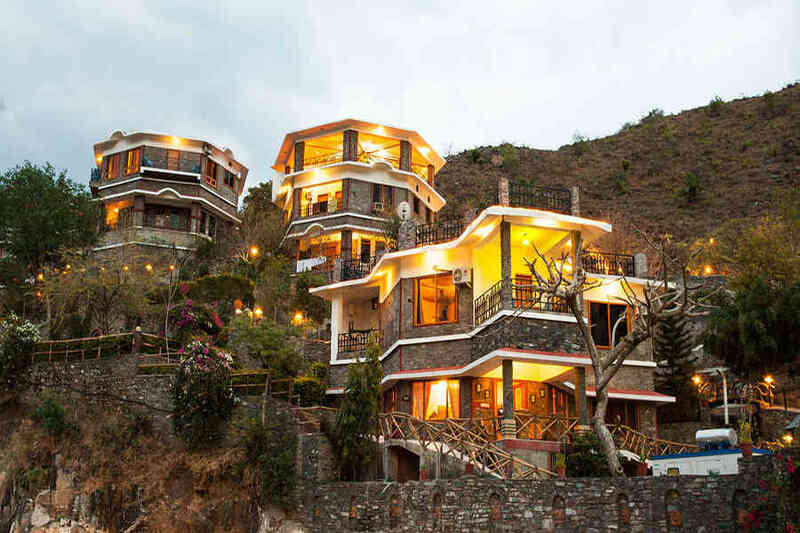 Use the form below to inquire about Resort At Kumbhalgarh In Rajasthan . 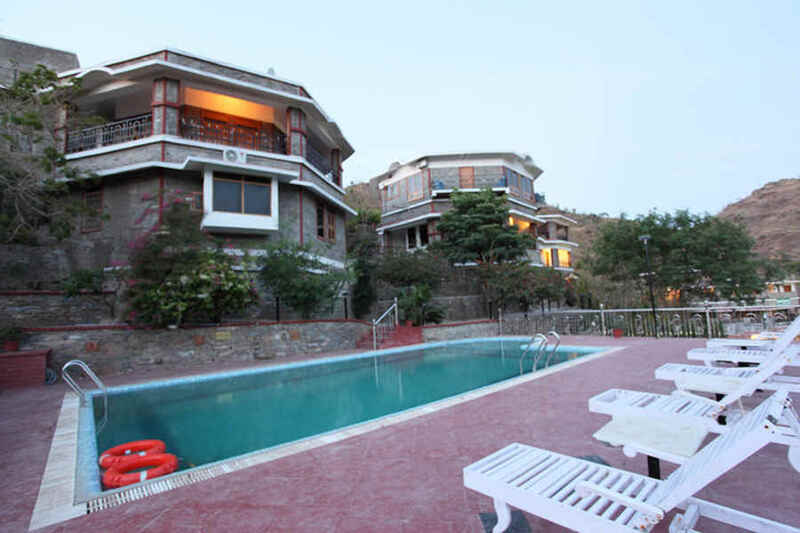 Use the form below to reserve for Resort At Kumbhalgarh In Rajasthan . The Resort At Kumbhalgarh In Rajasthan is your gateway to go back in history to experience the royalty of the Rajput era. Second only to the Great Wall of China, the Kumbhalgarh Fort will take your breath away with its vast expanse. Visiting the world’s second longest wall comes with its own share of adventures. 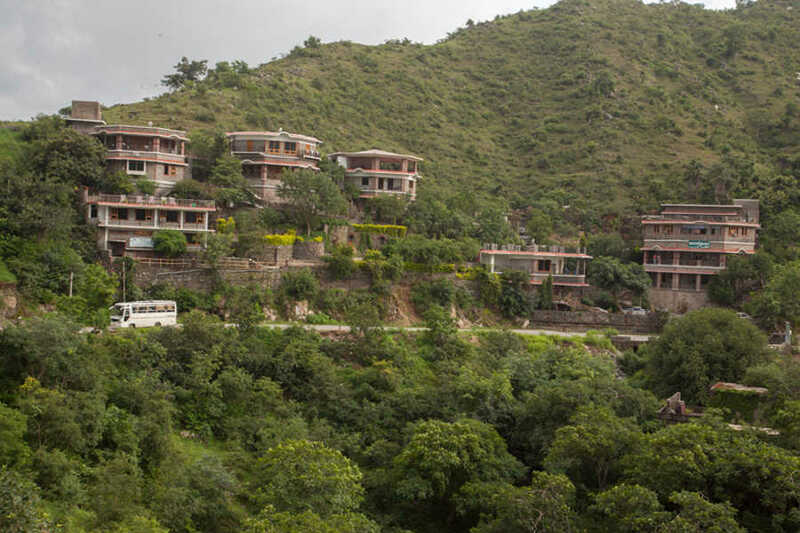 While the fort sits atop a hill affording sweeping views of the city below, it is the journey to the fort on the snaking roads twisting their way through the Aravalli Hills that makes it more special. The thick walls of the fort that stretch to almost 36 km enclose many ruined and well-preserved temples from as early as the second century BC. The fort also houses palaces, cannon bunkers, gardens, and step wells within its boundaries. The enormity of the fort does more than just remind you of its rich history. The secluded fort also offers royal charm for a romantic getaway. Experience this majestic beauty and all that this region has to offer by staying at the Resort At Kumbhalgarh In Rajasthan. 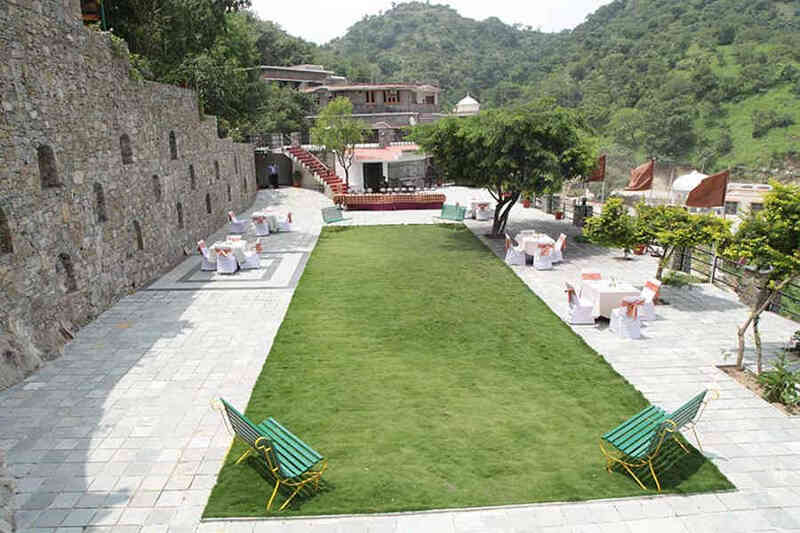 The Resort At Kumbhalgarh In Rajasthan is steeped in history and carries its own cultural appeal and heritage. Its location close to the Kumbhalgarh Fort lends it an equally alluring historic charm. The resort’s grandeur is just what you would expect from royal Rajasthan. While the architecture of the property is as royal as it gets, the views of the lush green valley it offers its guests is breathtaking too. The intimate ambiance at the resort promises to be perfect for not only holidays but also for hosting wedding parties and other events, a facility available at the resort. Among the other facilities, the property offers include a conference hall, a travel desk, a swimming pool, and fine dining options. 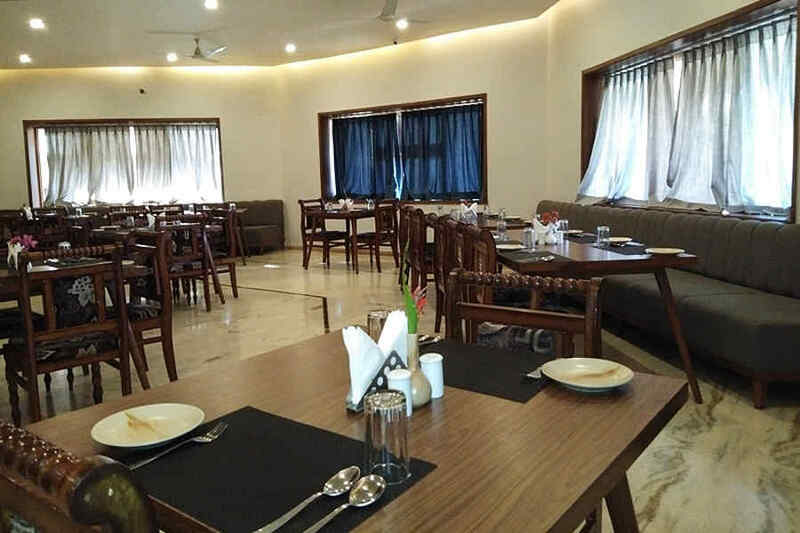 The resort’s in-house restaurant makes dining a regal affair with its offerings, which include a variety of multi-cuisine fare along with traditional Rajasthani favorites. After all, how can a trip to Rajasthan be complete without a plate of deliciously cooked dal-bati-churma? 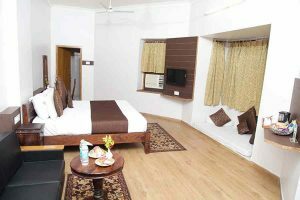 Accommodation at the Resort At Kumbhalgarh In Rajasthan includes 27 rooms categorized as Deluxe Rooms, Super Deluxe Rooms, and Suite Rooms. 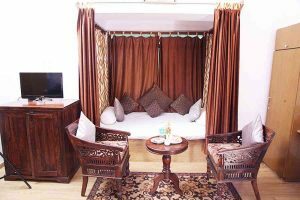 All the rooms are tastefully decorated, air-conditioned, and equipped with all the modern comforts and amenities, such as LCD television, mini bar, tea/coffee maker, etc. The details in interiors of each of the rooms include a mix of antiques and artwork that lend them an eclectic charm. The furnishing and upholstery reflect subtle luxury, which is perfectly in sync with the overall regal allure the property exudes. While some of the rooms offer spectacular views of the city of Kumbhalgarh, you can also see the fort’s wall from some areas on the property. Taking a leap into history cannot be any more royal or luxurious than staying at the resort, where providing guests unparalleled hospitality is a way of life. Dogs & Other Pets are not allowed. Car Parking is at owner's risk. Only the Registered guest(s) are allowed to stay in the reserved Room and no person(s) is/are not allowed at any cause. Visitors to the room are not permitted after 10.00 p.m. and are requested to meet them at the Lobby. Please refrain from bringing any eatables from outside. No-smoking in all the guest rooms and anywhere within the hotel premises other than the terrace area of the premises; it any found in the premise and it should be treated as violated the terms and condition of our hotel policy. Cancellation before 30 days: - No retention will be charged. Cancellation between 15 and 30 days: - 50% retention charges on the reserved room rate. Cancellation below 15 days:- 75% retention charges on the reserved room rate. Cancellation received less than 72 hours prior to the arrival: - 100% retention will be charged on the reserved room rate. No refund will be eligible in case of no-show where the customer arrives late or does not turn up for the event. Your holiday at this enchanting resort is your opportunity to hike around the second largest wall in the world! Take your time to admire the beauty and majesty of this ancient fort. There are many Jain and Hindu temples, both ruined and intact, within the fort’s boundaries. In the evening, the fort is lit up for some time, which is a sight you should not miss. While you are there, you should also keep a lookout for the Thar Desert sand dunes on the horizon. If you are a shutterbug, this is a sight something you would want to capture. 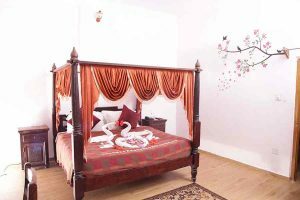 Visit the other attractions in the area, including Badal Mahal, Vedi Temple, Neelkanth Mahadeo Temple, Muchchal Mahavir Temple, Kumbhalgarh National Park, and Mammadev Temple. In between your sightseeing excursions, you can relax by the resort’s swimming pool, which is also a great way to beat the Rajasthan heat and unwind yourself. 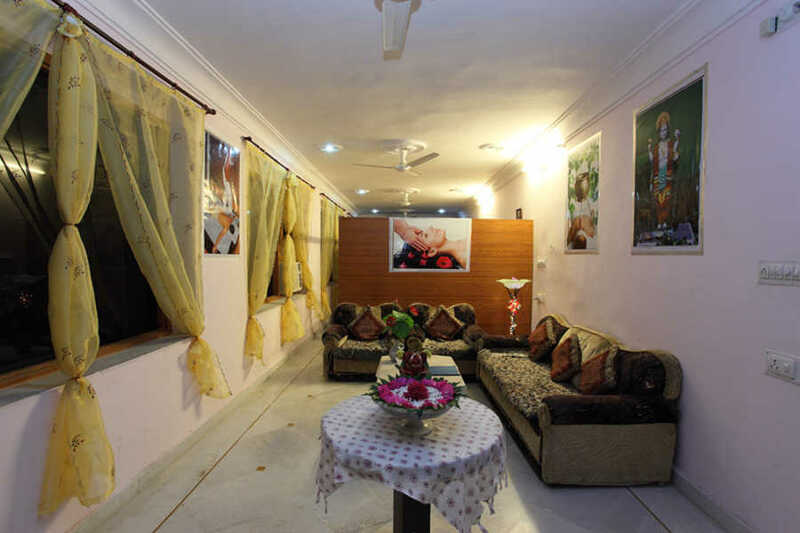 The closest airport from the resort is the Maharana Pratap Airport in Udaipur, located approximately 94 km away. The international airport in Delhi is located 586 km away. Located 64 km away, Falna Railway Station is the nearest railhead from the Kumbhalgarh resort, followed by Udaipur Railway Station (105 km). The New Delhi Railway Station is located 600 km away from the resort. The resort is well-connected to many cities by road. It is only a drive away from Udaipur (81 km), Ajmer (212 km), Jaipur (341 km), Ahmedabad (353 km), Agra (581 km), Delhi (597 km) and Kanpur (844 km), among many other places.